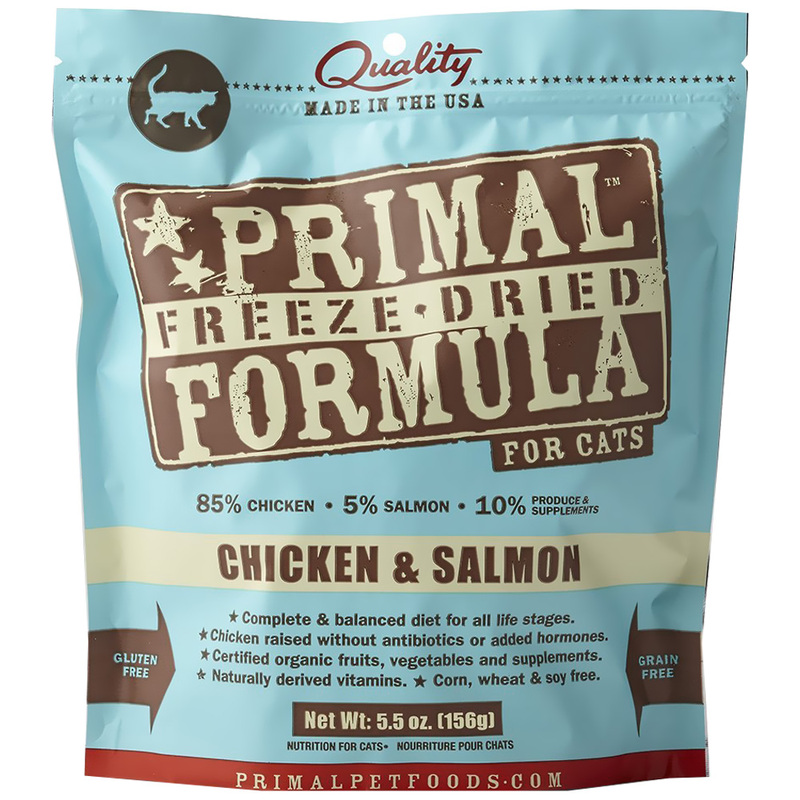 Primal Freeze-Dried Formula - Chicken & Salmon Cat Food (5.5 oz) is a complete and balanced raw diet with a great taste to keep your cat both healthy and satisfied. This food uses only the best ingredients to achieve an optimal nutritional balance that works to maintain proper body weight and keep your cat in good health. The formula also avoids filler ingredients that can be difficult for your cat to digest, such as corn, wheat and soy. Primal Freeze-Dried Formula for Cats is made with quality chicken that were raised without antibiotics or added hormones. 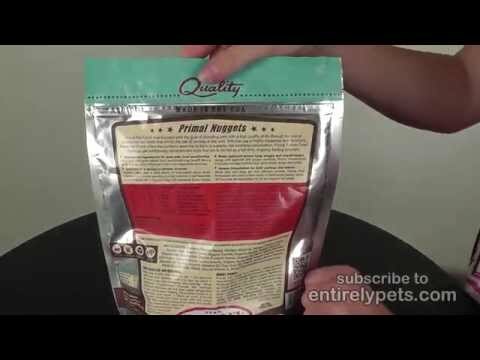 This resealable bag comes with 5.5 ounces of quality freeze-dried food that your cat will love. Keep your cat happy and healthy with this amazing freeze-dried raw food formula and order today! Ingredients: Chicken, Chicken Necks, Chicken Gizzards, Salmon, Chicken Livers, Organic Kale, Organic Yams, Organic Carrots, Organic Apples, Organic Broccoli, Cranberries, Blueberries, Organic Pumpkin Seeds, Organic Sunflower Seeds, Minerals (Zinc Sulfate, Copper Carbonate, Selenium), Organic Apple Cider Vinegar, Organic Parsley, Salmon Oil, Taurine, Organic Coconut Oil, Cod Liver Oil, Organic Quinoa Sprout Powder, Dried Organic Kelp, Alfalfa, Natural Vitamin E, Mixed Tocopherols (natural preservative). Feeding Directions: Because of the importance of moisture in a raw diet, we recommend rehydrating this product for optimum nutrition absorption. To rehydrate, add 1 tablespoon of water for every nugget or ¼ cup of water for 4 nuggets. For best rehydrating results, break nugget into small pieces and mix thoroughly with water to force moisture into product. Feed adult cats the equivalent of 2-3% of their body weight in rehydrated food per day (see weight chart and percentages). Transition slowly. Begin by mixing ¼ parts freeze-dried to ¾ parts current diet. Gradually increasae amount of freeze-dried meals. Kittebs and pregnant or lactating females: divide total daily feeding potion into 3-4 meals. Because calories vary between products, this feeding chart is based on 2.5% and formula rotation. Your cat's activity, age, metabolism and breed may affect overall feeding quantity. Visit primalpetfoods.com/calculator for specific feeding information. *Percentages based on rehydration of product.